For most people in the US, gathering with family to eat an enormous holiday meal, and maybe express gratitude between forkfuls, is a day looked upon with mixed anticipation and angst. Will everyone get along? How am I going to get all of these dishes cooked all at the same time? Will I have to put up with my uncles same stupid jokes? Am I going to gain weight just looking at all of that food? And my favorite: You don’t eat _______ ? Sigh. The typical Thanksgiving dinner averages a staggering 3500 calories, which is the number of calories it takes to gain a pound (I’m not going to get into the fat grams, or types of fat, but let’s say its a complete overload). Many meals with all the creamy trimmings go as high as 4500 calories for a single meal, including desserts and drinks. No wonder everyone wants to take a nap after ingesting that much food. Your body has to do some serious work to digest 2 days worth of calories from a single meal. It’s not the small amounts of L-Tryptophan in the turkey to blame, it’s the heavy fats and mountains of simple carbohydrates most people overindulge in that really does it. Which is why even vegans can go into a carb coma. So how to stay within healthy limits while still indulging? First, don’t go to dinner already starving. Make sure you’ve had enough food earlier in the day, preferably fruits and greens, which are cleansing and tend to be skipped at most holiday meals. A big green smoothie with some coconut oil or hemp seeds to give you some healthy fats would be ideal. Snack on some raw nuts on the drive for some protein, or have my pumpkin smoothie. Make sure you have a lot of water, too. It will fill you up, and get you hydrated. When it comes time for you to eat, only sip water (preferably with lemon) during your meal. If you gulp water, you’ll dilute your digestive juices, which you desperately need to work through all that sustenance. Otherwise, you could end up with a major stomach ache. When you arrive at the dinner table, choose a few of your favorite sides, and pass on the rest. Odds are, this is not your last meal ever, so don’t plate up like it is. Be discerning with what it is that you really enjoy eating, maybe your three or four favorite things that makes this meal memorable. It really is OK to fill your plate. Once. Do you really need to go back and fill your entire plate again? You probably really don’t. Especially when dessert is still likely to follow. I would typically suggest making your plate mostly vegetables, but at this meal, many veggies are slathered in butter and/or cream sauce. 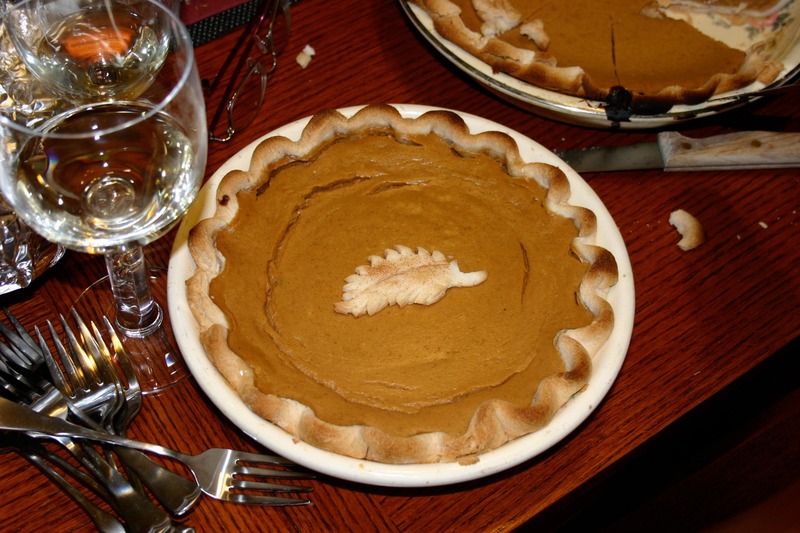 If that’s traditional fare that makes Thanksgiving Thanksgiving to you, go light on the serving sizes, and savor each and every bite so that you get the full experience of those childhood favorites. No guilt necessary. Really. If you feel bad about what you’re eating, I can promise you you’ll assimilate it differently and probably will gain more weight than if you just give yourself permission and enjoy it. Your attitude really does make a difference. If possible, do load up on non-creamy vegetables, such as roasted brussel sprouts, and root vegetables like sweet potatoes (lower glycemic than white potatoes), turnips, and carrots–amazing with rosemary, garlic and sea salt. Bonus points for broccoli added in. Have some leafy greens if possible, light on dressing. These are great items to offer to bring, just to make sure you have something you enjoy. A quinoa pilaf is also a great dish to share. One of my favorite easy sides is to toss kale in hazelnut oil, and sauté with garlic. Combine it with some quinoa cooked in vegetable broth and toss in some diced sun-dried tomatoes. Kids love this, too. Shaved brussel sprouts sautéed in hazelnut oil and garlic is also amazing. Finish it with a little balsamic vinegar and serve with chopped toasted hazelnuts. Simple, healthy and delicious. If you can’t pass up grandmas to-die-for rolls, have one (you lucky people that can have gluten). Then ask for half a slice of pie at dessert. You may appreciate it more if you are only having a few bites rather than a big piece anyway. I also recommend taking digestive enzymes with large meals, or HCL. They give you a helpful digestive boost, especially if you are over 40 years old. As our digestive enzymes diminish with age, a little help is actually a huge help. Look for plant-based enzymes, as some contain ox bile, which can be upsetting to the stomach. If you do have family that is difficult for you, adopt one of my favorite mantras: “Your opinion of me is none of my business”. I love how freeing it is, and it’s so true. If someone doesn’t get you, send them love and light and move on to someone who does. If the whole room doesn’t get you, go take that walk solo. Or maybe with a four-legged friend. And lastly, be in gratitude. This gets pushed to the side like cold potatoes, but it’s what Thanks-Giving really is supposed to be about. If there is not a lot about the day with family that makes you feel grateful, be grateful at how far you’ve come. Be grateful for the people who are loving and supportive in your life. Be grateful that you are you, living this amazing life. Whatever it is that fills your soul, be thankful. It will do ever so much more for you than a second piece of pie.